Hi, today I am posting the last of my California cards. Many thanks to Betty and Greta for sending along the die cuts, I had such fun playing with them! I am back in Maryland. Here are a few more of the cards I put together in California while visiting my Dad. It is always bitter sweet leaving - I miss hubs and am anxious to see him again; and I am sad to leave my Dad. I love that cat and dog from Simon Says, as well as the Autumn Greeting set. I did pull some small images from a Lawn Fawn Party animal set to add the had and pumpkin to the first card. I miscalculated this summer when making birthday cards, I had one more that I needed. This is my last made card from California - tomorrow I hop on the plane to return to Maryland. The roses are from Altenew, the greeting from Simon Says Stamp and the background script is from Hero arts. I used altenew inks in the yellow tones and PPP sequins in the fall mix. As far as crafting goes I learned something about my tools on this trip. I brought along a stamp platform from WRM. That platform is going to be downgraded to envelope stamping use - for my return address and any decorations I might add. The lid is thicker and doesn't give in to finger tip pressure on photo-polymer stamps. I have found for me the tonic platform is best for rubber; because, not all photo-polymer stamps are the same thickness and with a sturdier lid there sometimes is a pressing issue for me. I also own the mini misti and the original size. I have been using my mini for envelopes, but after these two months...that mini is going in my travel bin. Because I use mostly the clear photo-polymer stamps I so missed my misti's. Their lids are the perfect thickness to add a little extra pressure and that foam insert makes for a clean stamping. When I need to replace a stamping platform -- its going to be another misti...I am just not in love with the other options mostly because I prefer clear stamps. For rubber stamps any of them works well for me. A couple more cards from a marathon card making session in California while visiting my Dad. That diagonal stripe frame came from Greta, and I love it embossed. Since I don't make a lot of Halloween or Thanksgiving cards anymore and I still want to keep in touch with friends I love the idea of fall cards. They can be mailed from September to November here in the northern hemisphere and its not so much pressure to meet a calendar deadline. My friend Greta sent me these coverplate cutouts and I added some brown glittery embossing powder to make a nice frame. The under panel was sponged with some ranger inks. I added a brown ink over all the colors to give it a more autumnal feel--left alone the colors were too bright. Still in California and using up a few more bits that I have been saving. These come from Greta and Betty (Thank You so much). I heat embossed the diagonal striped panel in Gold, then colored the iris's with the watercolor brush tip pens. I fussy cut them out (ya I so dislike fussy cutting...but it was worth it.) and popped a couple in each embossed panel. Added a Hero Arts sentiment and mounted it on a layer of purple which was also sponged a bit along the edges for added depth and texture. I made two and just changed up the sentiment strip. 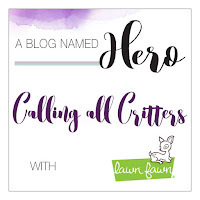 I'm still playing on the west coast, today I am playing along with A Blog Named Hero, they are using Lawn Fawn Critters for this challenge. Luckily I brought both HA and LF stamps with me. My main panel has the raccoon from LF's Holiday Party Animal and the sentiment comes from the Hero arts Stamp and cut Hello set. Last Saturday I played in a Hero Arts Scramble. They have taken on a new format. They are all 24 hours now in which the participant gets to choose their own 90 minute window to make photograph and upload to the flickr group their card. I was hoping I could play along, I had a sentiment set, two flower sets, and some odds and ends diecut in my travel crafty kit. Fortunately, the theme Autumn with some metallic element was the theme. In my envelope of odds and ends I found some copper embossed leaves that were from the September '16 Hero Arts My Monthly Hero kit that Betty (our hostess coincidentally) had sent me last year. I used my hello die along with the leaves to create two masculine feel cards despite the copper/rosegold metallic elements. Since these had gone so fast and I still had a bit of time left over - one more card. Using the color layering stamp set. It gives me fits...and I think it needs a new home- anyone interested? Its a bit cool and breezy here at my Dad's in SO Cal. He lives in the desert and today it was a hi of 71 with wind...I think there are maybe 2 months out of the year without wind. I'd forgotten about my fall allergies while living in Maryland...but I have been reminded with a vengeance. 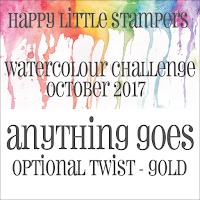 Two cards today, and both are inspired by two challenges; Give Thanks at Shopping our Stash and HLS's October Watercolor challenge to use watercolor with the option of gold. 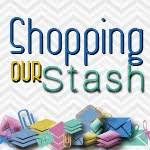 I shopped my stash of collected die cuts from bloggy friends. I believe both of these came from Greta. She kindly cut them from bristol. I used watercolors to drops bits of color on the leaves, dried then then coated them with some clear embossing. The bigger leaves were embellished with an additional "dip" of gold embossing on their tips. A bit of wonderful Monarch Orange Archival ink was sponged along the card sides. The smaller leaves are all attached to a small strip which I gold embossed to tie into my gold embossed sentiment. The second card got a gold line of versamark marker to emboss a thin gold strip. (much easier than attaching a strip of gold foiled paper) The sentiment is from Simon Says Stamp. Leaves attached, and the cards are done. Two more for my fall stash! Hi There, since I don't have a lot of supplies here...I am having to rely on techniques to inspire me. Although, having fewer supplies hasn't slowed my card making much...I made 20 cards in a week. Some have been posted already and some are yet to come. These two cars used Hero Arts, Hello stamp and cut set and the images are from Altenew's Bamboo Rose which I recently ordered. 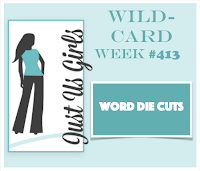 I am entering them to Darnell's NBUS challenge as well as Just Us Girls Challenge -Word Die Cuts.